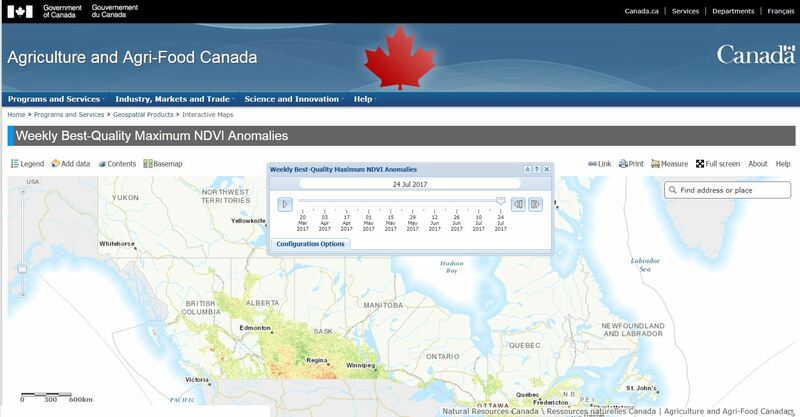 This application presents the Weekly Best-Quality Maximum-Normalized Difference Vegetation Index (NDVI) anomalies for Canada’s agricultural extent. The data is created daily and is averaged for the ISO standard week. Each pixel value corresponds to the difference (anomaly) between the mean n-year “Best-Quality” Max-NDVI of the week specified (e.g. Week 18, 2000-2014) and the “Best-Quality” Max-NDVI of the same week in a specific year (e.g. Week 18, 2014). Max-NDVI anomalies < 0 indicate where weekly Max-NDVI is lower than normal. Anomalies > 0 indicate where weekly Max-NDVI is higher than normal. Anomalies close to 0 indicate where weekly Max-NDVI is similar to normal.